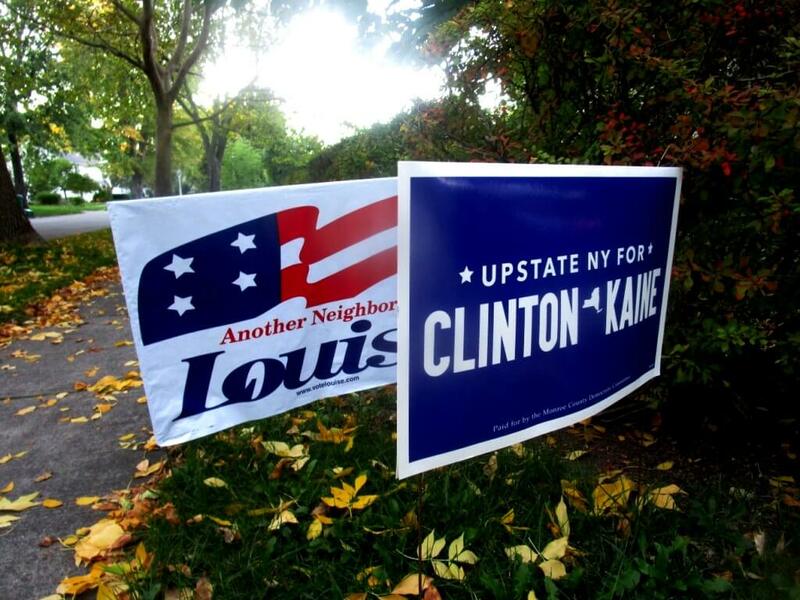 In politics, an axiom is that candidates and supporters love lawn signs, just as they are the bane of campaign managers. To managers, signs are an inefficient use of resources. Signs are expensive. Signs have to be put up and taken down. Signs are vandalized. You don’t get much for your buck. 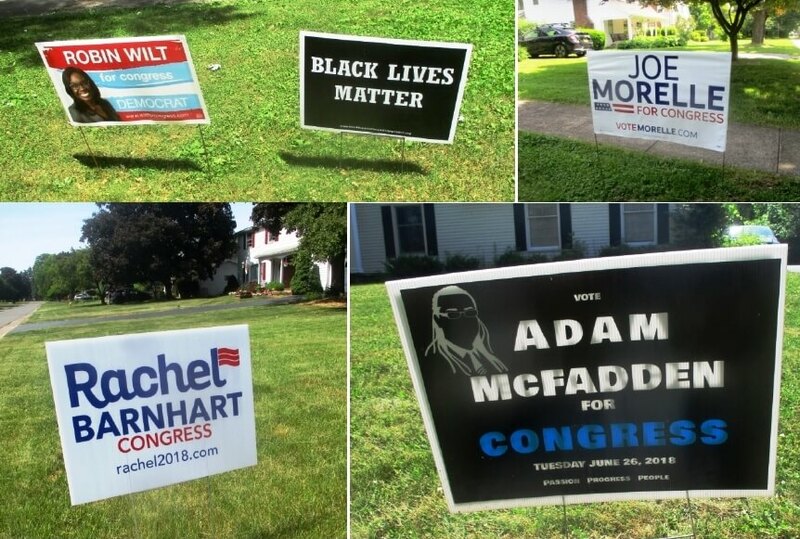 Studies show that lawn signs have a 1.7 percent impact on elections. At the same time, depending on circumstances, the number of signs can be a crude polling method to gauge how well a candidate is doing. But, since 1984 the proliferation of lawn signs has quadrupled. Even if signs might not influence their neighbors — or might even turn them off — people are drawn to this personal expression that also is a form of a collective voice, a shared sense of solidarity with other signers. As the 25th Congressional District is having a Democratic primary to replace Louise Slaughter, I went around my Meadowbrook neighborhood and a few surrounding streets in Brighton to see what the signs said. I spoke with about a dozen people. Most striking — and noticed by all — was how few signs there are. I went up and down several streets that did not have a single sign. If signs are an indication, engagement in this particular election is low. People cited various possible factors for the paucity of signs and the seemingly low engagement. Many mentioned that voters are not used to a primary or any election in June. Some voters are also confused that another primary is scheduled for September. Furthermore, there has not been a contested primary in decades for Slaughter’s seat, reinforcing the unfamiliarity with summer primaries. Along those lines, people’s political focus has not yet shifted to a post-Louise mindset after decades of continuity. Some mentioned that three of the candidates have low budgets and signs are expensive. One or two said that because Joe Morelle and Robin Wilt who represent Brighton are both in the race, some people might want to appear neutral at this stage. Those few who did have signs did so for similar reasons. Most Morelle supporters knew Joe personally or had positive contact. A Morelle supporter (although she was debating Wilt vs. Morelle for a long time) has a very close friend whose daughter volunteers for Joe. The daughter of the couple who support Rachel Barnhart volunteers for her campaign. The McFadden supporter has a relative who is close to Adam. One Wilt supporter helped Robin get signatures to run. In general, people said they install signs as a show of support for their preferred candidate and also as a form of personal expression. When I mentioned that signs probably have little impact on the outcome, everyone concurred. They are not expecting to change minds. One Morelle supporter did place her sign as a way to spark conversation. And it has. When working in her yard, people have talked politics with her and discussed her vexed decision to choose Morelle over Wilt. One Wilt supporter said his sign was part of a persuasive strategy. Wilt lacks the name recognition of Morelle so his sign has a name-exposure intent. The same Wilt supporter says he hopes his sign will buoy other Wilt supports — as their signs buoy him — and boost morale in what he says is an admittedly uphill contest. One woman said her sign was a way to support her candidate without having to make a campaign contribution. One very civic minded woman put her sign up to remind people there is a primary election — whether they vote for her candidate or not. As for the signs themselves, Morelle has by far the most. In Meadowbrook, I saw only one Wilt, one McFadden and one Barnhart. By contrast, Morelle has about a dozen. In the surrounding streets, there are more Wilts and Barnharts, and also more Morelles. The ratio of Morelle to his closest competitor, Wilt, is about 6 – 1. Of the people I asked, most took this as a sign of an easy Morelle victory. However, when I spoke with Alex White who has run several times as a Green Party candidate — and once gave a class at the Flying Squirrel on managing an election campaign — Alex claimed that signs, at least in this election, are not a particularly accurate barometer for the outcome. First, Alex said that emphasizing signs is just one campaign strategy. Candidates decide how many signs to buy and try to place them judiciously at high visible cites. Morelle’s campaign has more money to invest in signs; while the other candidates are using different strategies. Furthermore, because Morelle was endorsed by the local Democratic party, he has access to the lists of those who put up Slaughter signs. His campaign called me, asking that since I had a Slaughter sign, would I want a Morelle? Preferring neutrality, I declined. Alex also pointed that too many signs can backfire. If voters anticipate a landslide, they might not vote, especially if they have a particularly busy schedule today. Alex makes good points, but its hard to fully accept that the Morelle’s sign advantage won’t translate into a big victory. We’ll know tonight. After all these years, it is strange not seeing those Louise signs.